We have seen Componendo dividendo to simplify competitive math problems in topics as diverse as—number system, ratio and proportion, surds, trigonometry or algebra. Often, it plays a key role in solving the problems quickly. In this session we will show how Componendo dividendo can be applied to quickly solve problems in number system and ratio and proportion. You may refer to the earlier sessions on componendo dividendo to have a better awareness. 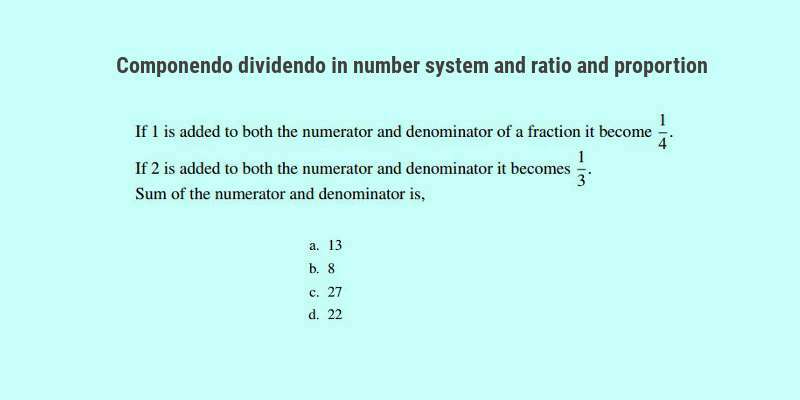 As the operations in both cases on the numerator and denominator are uniform, we decide to use Componendo dividendo. Key concepts used: Pattern recognition and use -- Componendo dividendo -- efficient simplification. The process of componendo dividendo is so easy and systematic that it can be carried out in mind. We do not need to write the steps as above. It was not apparent from the problem description that componendo dividendo can be apllied directly, but we recognized the opportunity from the uniformity of operation in both numerator and denominator, that too in both cases. It needed some amount of goal-directed manipulation of expression to apply componendo dividendo, but overall, the ease of the individual steps, if you are able to visualize them, enables us to solve the problem quickly in mind. We call this type of application as Hidden Componendo dividendo. That is the hallmark of componendo dividendo—if you manage to apply it to a problem, you will usually be able to solve it quickly and in mind. We have simplified the numerator by eliminating $b$. These tasks of adding 1 to fractions, inverting the fraction and so on are simple processes and can be quickly done in mind without using pen and paper. If you are skilled in this type of mental manipulation, this approach should reach you to the solution pretty quick. Observe that we have not applied all the three steps of componendo dividendo in this problem, we have just applied the first step to simplify the numerator to one variable expression so that we can reverse and simplify all in mind dealing with simpler expressions.